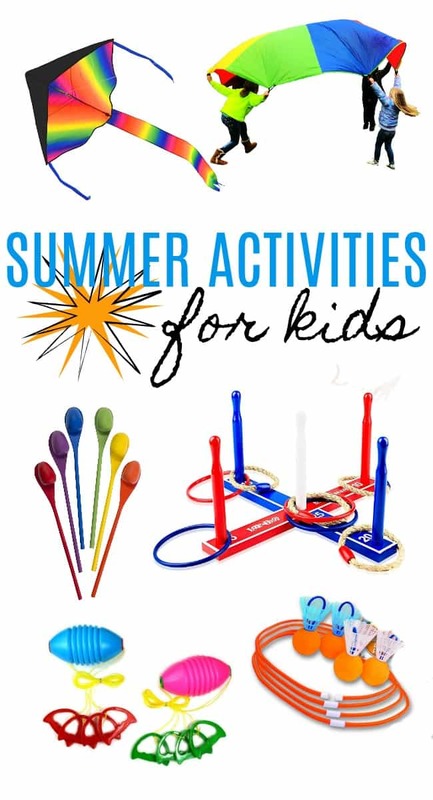 Kids Summer Activities on Amazon! We have been out of school for the summer for about 6 weeks now, crazy. We have even less time before school is back in session. Sad panda!! That doesn’t mean we can’t enjoy every bit of the time we have left with some of those great kids summer activities, especially outdoor ones. I have rounded up some of the best activities for kids on Amazon that I could find. Plus if you are a prime user then you can have these in your hands and ready to play super quick. Not to mention Prime Day is coming up on July 11th. Hookey Ring Toss Game: This ring toss is super easy. Just hang it on the wall and get to tossing. Great fun for the whole family. Zip Ball Game: This zip ball game is a fun sliding fitness game for kids. Great for an interactive workout. They even have a splash water version. Rainbow Kite: This rainbow kite is easy to assemble, launch and fly wherever you would like to go from the beach to the park. I love the fun bright eye-catching colors. Loop & Hoop Ring Toss: A fun alternative to horseshoes that is fun for the whole entire family. Rocket Birdie: The classic game of lawn darts has added the element of the built in “birdie cone” on the classic ball. A fun version of the classic lawn darts, love it. Parachute: We have always loved the parachute. It is great for parties, picnics and larger group activities. Egg & Spoon Race: A classic party game that would be fun for a summer gathering. Check out even more great summer time activities! Celebrate all year with Jasco’s Enbrighten Color Changing Lights! Thanksgiving games for kids and the whole family!